This was my first Born 2 Run event, but I had heard plenty of good reports about them before I had even applied. 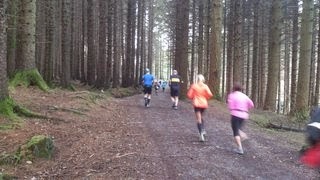 The race was set in the beautiful Tollymore Forest Park, which was complimented with some early morning winter sunshine. 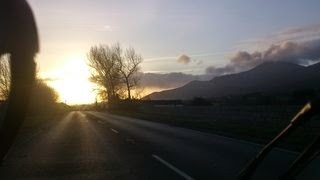 I just about managed to take this whilst driving to the race. I've written before about race day preparation, but for some reason I failed to do most of this today. I had a few things to do before leaving the house, so had managed to miss breakfast and turned up with only twenty minutes before the start. They included safety pins with the chip and number, which was handy as I'd forgotten mine. Turns out it's not my lucky number..
Thankfully the car park, registration and starting line were all beside each other, so I had time for a proper warm up before one of the organisers took to the microphone dressed as a Santa's Elf. I was thinking how different this was to everyone else's Saturday panic shopping the week before Christmas. We actually seemed quite happy to be crowded round each other. Headphones on, let's get running. After some Bruce Springsteen blaring from the speakers, the race started and off we went. The first few minutes were spent on everyone's toes as we did a lap of the two car parks with some very tight and narrow turns. I started to make my way through the pack as it was a slower pace than I wanted from where I started. I wasn't sure how fast most of the runners would be, and I found myself overtaking more and more people with every minute that passed. Had I underestimated myself? Was I really that fit? 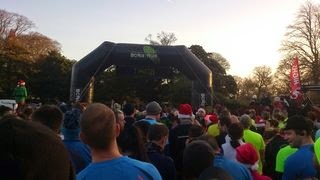 Was I one of the fastest runners here this morning? Well, it turns out the answer to all these questions was no. 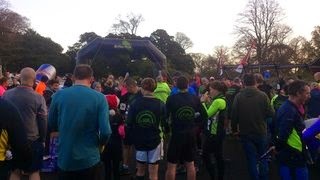 I just started at a fast pace (I ran my first two miles in 14.30 minutes) and most of the people I whizzed past at the start, soon got to do exactly the same to me. My first mile was finished in 7 minutes 04 seconds and all sorts of thoughts were going through my head of how fast I could finish the race. This was enhanced when my second mile was completed in 7 minutes 34 seconds. 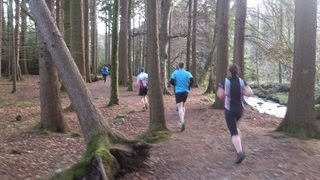 Slightly slower but we had got past quite a big hill. My third was just over 8 minutes but still respectable. I don't think I had given enough respect to the 10K race. Yes, I've done a few half marathons at a decent pace, but that doesn't mean races like this will be easy. I think I had underestimated it and assumed it would be a walk in the park. Ironically, it soon turned out to be just that. I stopped a few times, trying to figure out in my head what was going wrong. My calf muscles were hurting on every hill, my feet were numb and my energy seemed to be non existent. So for two miles I walked up the hills and even on a few of the level parts too. It did give me a chance to take a couple of pictures though. 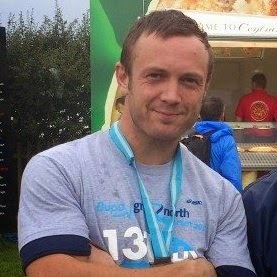 I managed to get my head sorted and my legs into gear and ran the final mile. The lack of breakfast and previous training showed, but I wanted to finish the race running. I managed mile six in 7.25 minutes. Approaching the end of the race was made easier by those that had already finished clapping and cheering me on. It makes a big difference and I find the support at these races from fellow runners to be amazing. Another special mention should be made to the marshals and helpers who also cheer you on with a smile on their faces. I always like to smile back and say thank you as without them these races wouldn't be the same. They all do it for free, so giving a smile and a thank you is the least I can do. So much sugar being consumed.. I finished the race in 53 minutes 29 seconds, which I was both pleased with and annoyed at the same time. I had made finishing a 10K trail race in under 54 minutes one of my goals in my Half Marathon Date Set post, but I know I could have done much better. 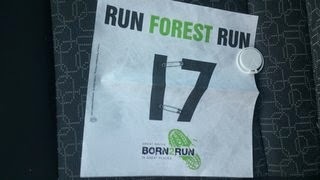 There is another Born 2 Run race in two weeks and I want to get a much better time at it. I'm not sure of the course, but I need to be better prepared than this attempt. A few more 2 mile speed runs and a longer 4 - 6 mile run should help. I also need to remember that all this is training for my half marathon in March, so even though I wasn't happy with my run, it is still training and race experience. These races are a great way to push yourself, and for the first few miles I did just that. I need to work on my final half now. 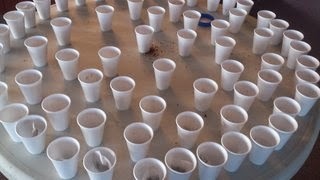 After the race hot soup and wheaten bread was served along with tea or coffee. To be able to perform a decent race review, I had both. I can report that both were lovely. I also walked away with a tin of Red Bull, bottle of water, a banana, a High5 protein shake and a chocolate selection pack. The only complaint I would have about the event is that currently the race times are only available to those that have Microsoft Office, something which I don't have. I therefore still don't know my official time or place, but other than that I thoroughly enjoyed racing on the Saturday before Christmas.